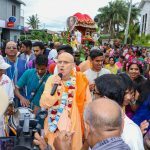 On Friday afternoon (14 October), Kadamba Kanana Swami arrived in Mauritius; an amazing country with a lot of culture and respect. Maharaj saw this within the first few moments after he landed. Whilst walking to the immigration counter he was respectfully greeted and ushered to the staff queue, which quickened things up. The immigration officers remembered Maharaj from the Kirtan Mela in 2014, which was the last time & also the first that he visited Mauritius. After collecting our bags, Maharaj was greeted and welcomed by a harinama in the airport and several garlands were offered to him. 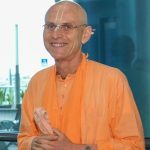 As Harinamananda Prabhu drove us to the house where we would be staying at, Maharaj was telling us of when he went to USA – he was interrogated at immigration whilst officials looked at all the stamps of countries he had travelled to and they questioned why he did so. When they came to the Mauritius stamp which says MRU and didn’t know what it was! Mauritius being a small island on the world map is easy to miss but an amazing country to visit. With only a population of 1 million, we were told there is roughly 10,000 devotees there and they have a great family feel vibe existing. Also they have Tulasi growing everywhere – in all the gardens, along the road sides, everywhere! 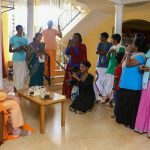 We experienced the family vibe the very moment Maharaj arrived at Harideva Prabhu’s house, where he would be staying for the first week in Mauritius. They respectfully welcomed Maharaj and made sure he was comfortable. On Saturday evening, Maharaj met the devotees at the Phoenix temple! The host introduced Maharaj saying that Maharaj is a thief! A bit of a shocking introduction that woke us up. He explained that the last time Maharaj was in Mauritius his kirtans stole many hearts away and now he has come to give them back. On that note, Maharaj said, “Well, thanks a lot for that introduction but no, I’ve only come to take away more!” The devotees then invited Maharaj to take them away for the evening! The Phoenix temple was completely packed, even chairs and the tent outside had devotees in them looking into the temple as Maharaj led what can only be described as an absolutely ecstatic kirtan that forced you to sing with more energy and dance with no stopping or worries! Almost 80% of the crowd was up dancing and some even flying as they were thrown into the air and then crowd surfing! 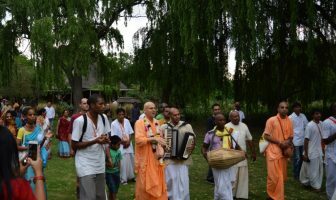 Maharaj’s kirtan took everyone far beyond the Mauritian Island and deep into Lord Caitanya’s sankirtana movement! What a start to the Mauritius tour it was! The following day, Maharaj gave the morning Srimad Bhagavatam class on verse 2.7.4. Maharaj spoke on how the guru-disciple relationship is similar to a parental relation. The disciple tries to become a servant and is trained via their service to the spiritual master. And this is really their saving grace otherwise we are constantly in the punar mushika bhava (becoming a mouse again) lifestyle because naturally we are fearful and small. Everything in our lives are about status and we have so many upadis, so many different identifications, which take away our ability to connect with Krsna. We don’t have to give up everything but rather use them as an offering for Krsna. Once Maharaj saw a car with the registration 4UKRSNA and he thought is this really “4 U Krsna” or “4 U driver”? It is not so easy give things to Krsna in the material world so we must be careful in our private lives and simplify things to what we really need only. Simplicity then easily leads to honesty and a detached nature. When we complicate things we see that it becomes harder to choose dharma over profit, something we are seeing more and more in India. So we need to intensify our service so there is no time for maya. This love in service purchases Krsna not gold, but we can donate that too. The reality is that Krsna’s heart is filled with love whereas we act and work more on jnana and have much more emphasis on standards leading to us forgetting about love. But the standards are there for us to develop an offering a higher quality of love! Later on that day, Maharaj also gave the Sunday feast class in the Phoenix temple. As this was the first day of Kartika, Maharaj began by stating that the puranas inform us this is the most important month. We see that with deities, Radharani comes first. So similarly before the month of Krsna which is the month when the Gita was spoken (Gita Jayanti), there is the month of Radharani, who is soft-hearted and inclined to bring people closer to Krsna. So this month is dearer to Krsna than his own month. We see in Vraja no-one really cares that Krsna is God. We know when Nanda Maharaj was arrested by Varuna’s men, he became amazed to be in Varuna’s assembly. But when Krsna came to the rescue, Varuna was amazed to see Krsna and started offering prayers to Him. Everyone began saying that Krsna is God, so initially it was exciting and new but soon after, everyone stopped talking about it and got bored of it. 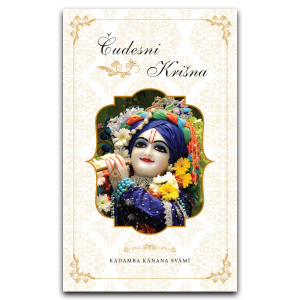 Vrindavan is really all about remembering Krsna. Mother Yasoda would find the tallest gopi to go the highest look-out post to wait for some sighting of Krsna and they would call out “dust!” knowing that the cows and cowherd boys were coming and so everyone would wait for this call! The dust from the cows covers Krsna’s shine, however those who are eager can dive deeper and only they see and understand His pastimes. We aren’t close to the devotion exhibited by the residents of Vraja. They give Him the best of everything and still He steals! But now we have the opportunity to take a vow to increase our focus and devotion to Lord Krsna. On Tuesday (18 October) evening, Maharaj went the Gita Centre, after having a day and a half of well-deserved rest. The Gita centre is a recently opened building which has a great outreach facility for people to come and learn the Gita systematically, and also be taught cooking and about the culture of Krsna Consciousness through aspects such as education, vegetarianism, etc. 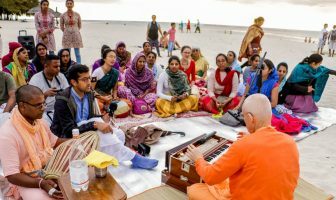 Maharaj first led a short kirtan which had people singing enthusiastically and got them on their feet jumping to reach the ceiling. Maharaj then began speaking on Arjuna’s lamentation and how Krsna was standing there smiling and laughing. Krsna being the source of everything, saw this was one small insignificant incident in comparison to the bigger picture. Arjuna, on the other hand being stuck in the situation was small-minded, looking at the world and making a big thing out of it all. So many such situations arise for us and Krsna is just laughing. 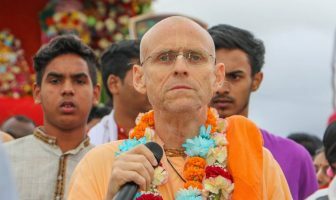 Maharaj recalled that when he received sannyasa at the Bhaktivedanta Manor, straight afterward the camera man zoomed in and asked how he felt. Maharaj replied, “Now there is more responsibility and I have to live up to it! But now I’m in the best position as a sannyasi!” Soon thereafter, Maharaj had to catch a boat to France and on the way he thought of the Bhagavad-gita verse 2.70 which talks about many rivers going into the sea and many desires in consciousness, but a Krsna Conscious person is unaffected. Upon reaching France, the security tried to take away Maharaj’s brand new danda! So he could see Krsna was laughing at him. Anyways, he fought for it and got it through eventually. Krsna does all this because he wants us to have the real deal and Arjuna is a prototype for us! And Lord Caitanya is the perfect example of the instructions of the Bhagavad-gita. It is one thing to live by dharma but we want to realize the deeper conclusions, not just follow the rules but develop love! So this is the real purpose of the Bhagavad-gita and the reason it was spoken on the battlefield was to create a crisis situation! Crisis situations are when we urgently need answers, “Now what do I do?” We’ve all had our crisis situations. 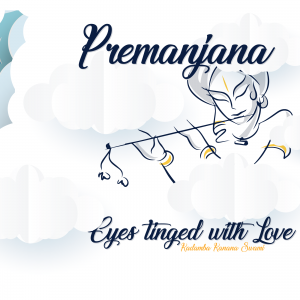 We see and learn how Arjuna, who was on equal levels to Krsna, changed and took the humble position to learn from Him. A few days later, on Thursday evening Maharaj was invited to a house program. As usual, Maharaj began with kirtan which had the room filled with dancing devotees, with some even dancing on the roof of the house! Maharaj gave a short, simple and sweet class talking about how Srila Prabhupada is totally attached to Krsna! In 1972 Prabhupada was giving class in Dallas and he gave a description of Vaikuntha, the planet devoid of fear! 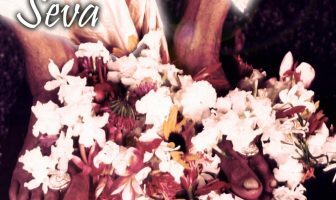 So afterwards everyone said that when Srila Prabhupada said Vaikuntha, they all experienced an atmosphere of complete ecstasy. And this lead to Rupa Vilasa Prabhu’s new book on Prabhupada being called “Without Fear”. However, we constantly have fear due to our attachments but the vrajabasis saw everything as prasada (mercy of the Lord) and this is the true vision of the vaisnavas. The following day marked a week of being in Mauritius. During the morning puja of Giriraja, Maharaj invited Vyasa Prabhu and his wife Radha Priya Mata to come and decorate the altar! And WOW what an altar they made! 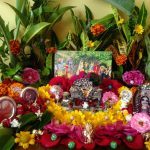 They brought in so many flowers, banana leafs, rangoli decoration made with coloured rice. Take a look at the pictures! It’s a must see unbeatable darsana with Maharaj saying, “You’ve made it look like Janmastami,” and being extremely pleased by their service. Later that evening we went to the Rose Belle temple where Maharaj lead the Damodarastakam prayers and spoke about how we are all pleasure seeking by nature. However, we have no idea where to look! We have so many distractions from our pride, aristocracy, etc … but only by the mercy of Srila Prabhupada we get to know all of that is insignificant. Prabhupada wanted countries and villages based on the Bhagavad-gita like Gita Nagari. He wanted many of them! The world is big enough for everyone’s needs but not their greed! Not their exploitive ways. And to stay away from this we need to be simply satisfied with what we’ve got and all will fit in place. If we don’t let go, one day Krsna will force us to. And as Maharaj was speaking about the economy being reliant and the need for simplifying life, suddenly the lights went off! This couldn’t have been planned better even if we tried! Krsna’s arrangement and timings were perfect! Then everything was dark and we all brought our mobile lights out and Maharaj joked that this was like a modern Diwali celebrations! 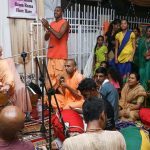 Saturday (22 October) marked the Mauritius Ratha Yatra festival! It was an ecstatic feeling as we all anticipated going through the streets and spreading the mercy around! Maharaj led the procession with all the djembe, mrdanga, kartal and womper players in a circle around him. Maharaj was firing-up the instrument players more and more, with hundreds of devotees dancing together and pulling the cart, and many others were looking at us respectfully to see what was going on. The process was incredible and we could see there were clouds forming. Suddenly a few drops fell and straight away umbrellas covered the circle but the kirtan and dancers became more ecstatic and enthusiastic! Everyone was singing and dancing even wilder when the rain began! I guess it was a sense of relief from the heat and an excuse to dance in a crazier fashion! 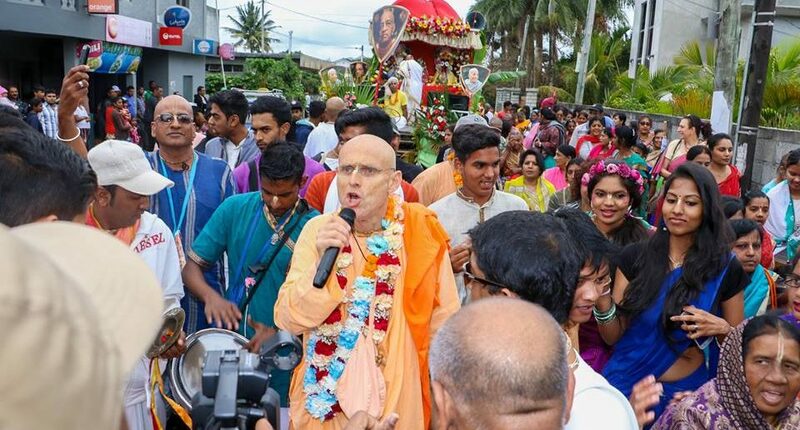 The procession went on for a few hours and when we reached the end point, where a tent was set up and thousands of people were receiving prasadam, Maharaj gave a short class on how this Ratha Yatra festival was very important to Srila Prabhupada. 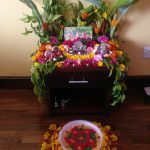 We know that at a young age Prabhupada wanted a cart similar to the one in Jagannatha Puri and this was a festival of openly spreading the mercy! 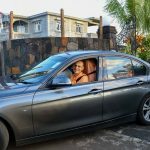 After the procession we moved to Amar Prabhu’s house near Flacq as this is the other side of Mauritius, near the Krsna Balarama temple where Maharaj would continue doing programs until the end of this stay in Mauritius. 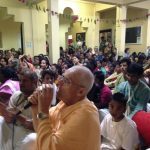 On 28 October, travelled back to South Africa and spent a few days in the Johannesburg area before leaving for Vrindavan.